Sydney Gill is just like other 19-year-olds – she has goals, ambitions and drive. The key difference is Sydney has a condition which keeps her in a constant state of major pain, rendering even the most simple tasks impossible at times. The pain actually started to flare up when she was nine years old, but was magnified after a fall when riding a pony through jumping exercises. When the pain on her right side vastly outdistanced the break in her collar bone on her left side, doctors knew something serious was amiss. What it proved to be was Neurogenic Thoracic Outlet Syndrome – a disease whereby the nerves in the upper brachial plexus (neck) are compressed, resulting in nerve pain. Since this diagnosis, Sydney has endured three surgeries, none remotely successful. Now, her sole option is a surgery with an 85 per cent success rate. Great, a viable option? Not so fast, notes Sydney’s father, David. The affliction is so rare, Canada has no specialists to deal with procedure which needs to be done. However, the Gills have found Dr. Dean Donahue at Massachusetts General in Boston who conducts the surgery. • Ongoing care and procedures at Mass General – $70,000. “We were denied any coverage of costs. The letter said the surgery would not present death or permanent tissue damage,” noted David. 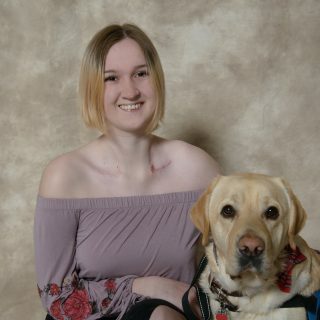 For Sydney – who does not go anywhere without her companion dog, Trooper, who carries everything from her meds to pencil case – her goals are modest. “I would like to be able to have kids some day. I would like to graduate high school and make something of myself. I want to be a pharmaceutical technician,” she said. Sydney has had to suspend her studies at Grimsby Secondary School due to excessive pain. To help the Gills cover the huge operation expense, a gofundme page has been set up, Hope For Sydney. The surgery is set for May 22.